The videgrab shows the officer pushing the snake around the suspect. 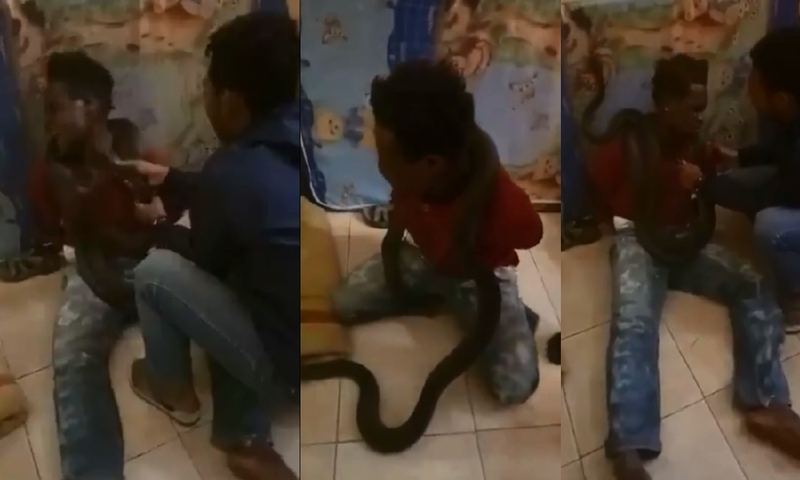 JAKARTA: Indonesian police have apologised and pledged disciplinary action after officers draped a live snake around the neck of a suspect to persuade him to confess during an interrogation session in the easternmost area of Papua. “We have taken stern action against the personnel,” he said, adding the officers themselves had not physically attacked the man. Papua police spokesman Ahmad Musthofa Kamal said the case was being investigated by the internal affairs unit and if violations of the law or code of conduct were proven action would be taken. Reports of human rights abuses by security forces often emerge from Papua, where a separatist movement has simmered for decades. The former Dutch colony, the resource-rich western part New Guinea island, was incorporated into Indonesia after a widely criticized U.N.-backed referendum in 1969. Veronica Koman, a human rights lawyer focused on Papua, said by text message that using a snake in this way represented torture and was not a one-off incident in the area.